Buddha demonstrated how to follow a path of inner transformation that leads to the complete eradication of all traces of negativity and confusion from the mind and the attainment of sublime qualities such as universal compassion and wisdom realizing the true nature of all phenomena. During his life he gave many teachings revealing the practices that lead to this realization of enlightenment. Later, the great Indian Pandit Atisha arranged all these teachings in the order in which they are to be practiced. This special arrangement became known as the Stages of the Path to Enlightenment, or Lamrim. Interested? Students wishing to join FP may attend a class before registering. Simpy show up to a class. 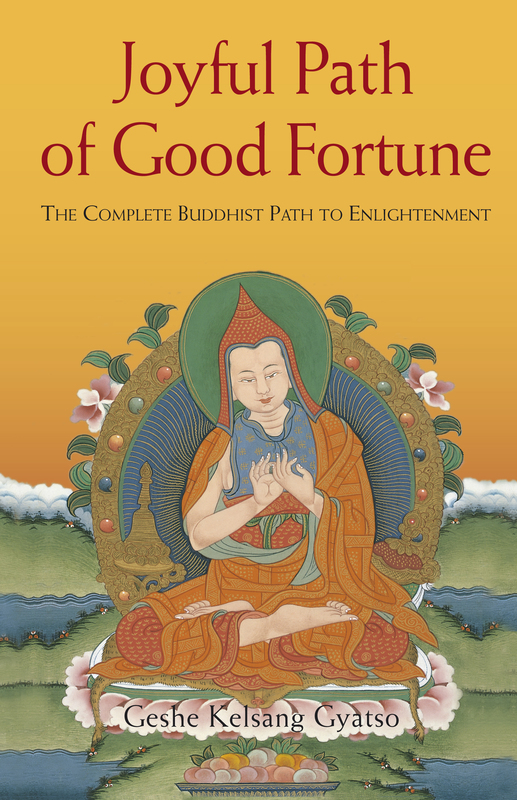 Joyful Path of Good Fortune – we gain the ability to put all Buddha’s teachings of both Sutra and Tantra into practice. We can easily make progress on and complete the stages of the path to the supreme happiness of enlightenment. From a practical point of view, the Stages of the Path is the main body of Buddha’s teachings, and the other teachings are like its limbs. Universal Compassion and Eight Steps to Happiness – we gain the ability to integrate Buddha’s teachings into our daily lives and solve all our human problems. Heart of Wisdom – we gain a realization of the ultimate nature of reality. By gaining this realization we can eliminate the ignorance of self-grasping, which is the root of all our suffering. Meaningful to Behold – we transform our daily activities into the Bodhisattva’s way of life, thereby making every moment of our human life meaningful. Understanding the Mind – we understand the relationship between our mind and its external objects. If we understand that objects depend upon the subjective mind, we can change the way objects appear to us by changing our own mind. Gradually we shall gain the ability to control our mind and in this way solve all our problems.